Srinagar, August 29: Hours after the security forces eliminated two top Hizb-ul-Mujahideen militants in south Kashmir’s Anantnag district, Hizb and Jaish militants killed four policemen in neighbouring Shopian. The militants decamped with weapons of the slain cops, who were all security guards of Shopian Deputy Superintendent of Police (Operations) Ashiq Tak. The DSP's picture with his four guards had gone viral on the social media after it appeared in the New York Times on August 1. The officer had trailed Hizb commander Sameer Tiger, who was killed on April 30 this year. The latter had allegedly killed his uncle Bashir Ahmad in Pulwama. 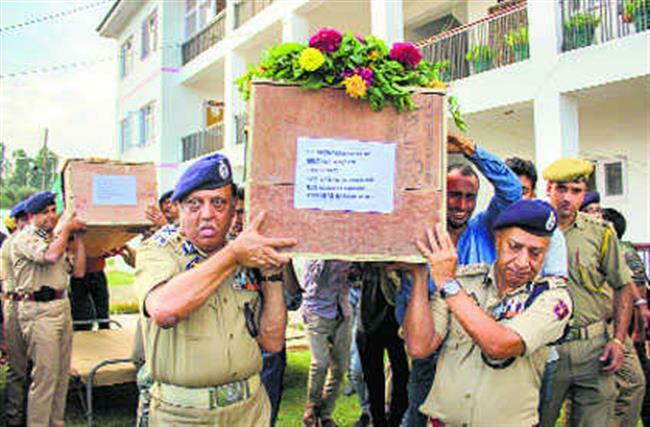 The slain policemen — Constables Ishfaq Ahmad Mir, Javed Ahmad Bhat and Muhammad Iqbal Mir and Special Police Officer (SPO) Adil Manzoor Bhat — had stopped at an auto workshop on the outskirts of Shopian for to get their official vehicle repaired. In Tral, militants abducted the son of a policeman late in the evening.